A mat for movement offers your baby some tummy time to strengthen his upper body. Attach a mirror to the wall at child height next to the bed or movement mat. When he sees himself move, he will make more effort to stretch and strengthen his neck muscles. Hang mobiles over your baby's head but out of reach, for beauty and for practice focusing and following objects. 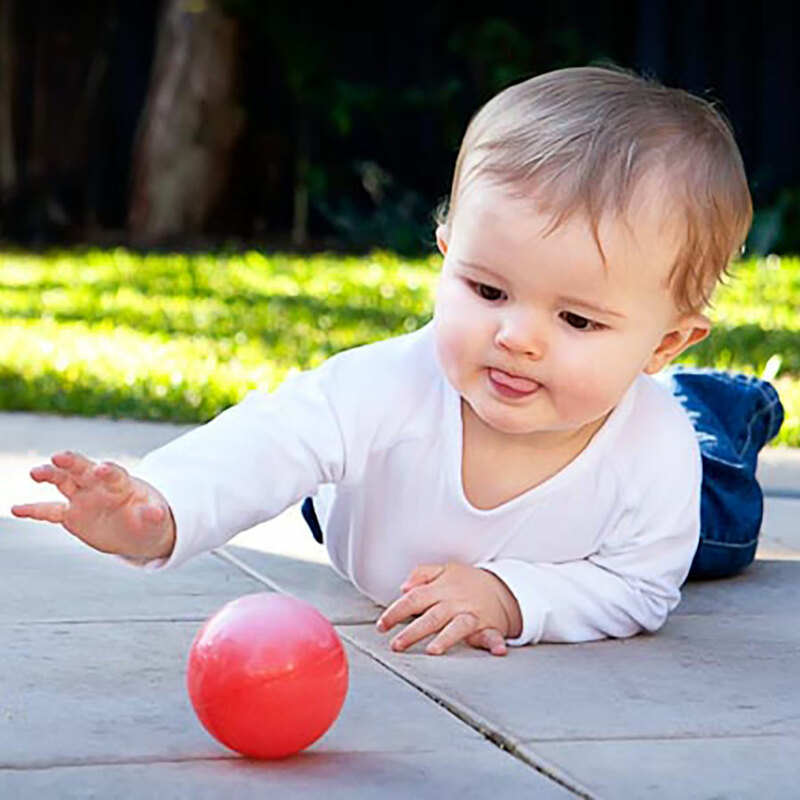 A few months later, encourage reaching and grasping by hanging a rattle or baby toy within his reach. Watch him bat, grasp, and explore the object. Choose clothing that allows for maximum movement, like short trousers with elastic waists, warm socks, and lightweight fabrics. His inner drive to exercise his limbs and body is frustrated by clothing that restricts movement. Provide reasons to move. Captivating objects just out of reach are an enticement to stretch, slither, creep, and crawl. Knit and cloth balls roll slowly, attract his grasping arms, and keep his attention. As he gains coordination offer faster-moving balls. Avoid equipment that limits your baby's movement. Playpens, walkers, stationary walkers, bouncers, and even swings confine and restrict movement. These devices enable babies to sit, stand, walk, or jump before they have the joy of achieving these steps through their own efforts. Create open space and a clean and orderly world for him to explore when he begins to creep, crawl, walk with support, and stand alone. Attach a wooden bar to the wall (two inches in diameter) for your baby to improve his strength and stability while pulling up. Find a place where he can practise climbing if you don't have stairs. Teach him how to crawl down the steps. Find places that offer big spaces for movement: playgrounds, public gymnasiums, parks, or health clubs. Provide large and heavy items for your walking toddler to carry and move. Use the stroller sparingly. Take time to allow your toddler to walk, because he is capable of walking great distances when you are not in a rush.